November 30th – support the strikes in Nottingham & Notts! there on Wednesday and throughout the week. More details: http://nottingham.indymedia.org/articles/2211 – note this venue has been evicted so please check indymedia to check if the events marked Free Space are going ahead. 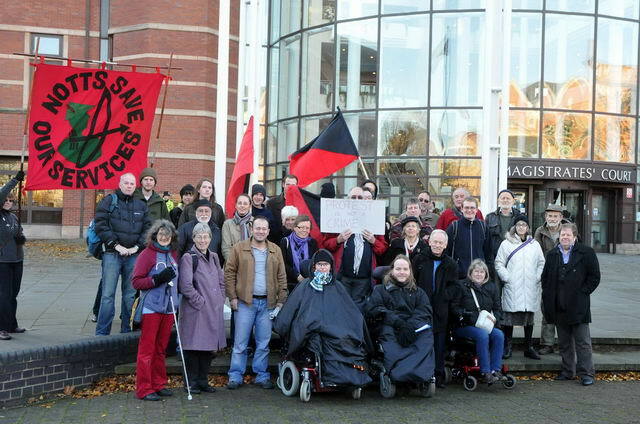 On Friday 25 November 2011 the “Atos Two” who were arrested during a protest at the ATOS Healthcare medical examination centre on Stoney Street in were due in Nottingham Magistrates Court. Bailed for 9.45am a solidarity demo had been called outside at 9.30am which was very well supported (see photo). There is already national awareness of the action taken by the authorities over this protest. ATOS (or SEMA in Scotland) has been the subject of protests all over the UK for its role in the government’s attack on disabled and ill benefits claimants. The ATOS Two trial will be held from Monday 27th February 2012. The anniversary issue of Notts SOS newsletter, no. 7, November 2011 is out. Our latest newsletter includes an overview of the year’s campaigning plus forthcoming action. We welcome new and updated information about local campaigns and about cuts to services. On Wednesday November 30th, up to 3 million workers are expected to take strike action in defence of pensions, in what is going to be an historic day for UK trade unions. Notts SOS will be supporting the local action. Many of us will be on strike. Gather 10.30 at Forest Recreation Ground and marching to Albert Hall at 11.30am. Bring banners and placards and anything else to make this a noisy demonstration. The march will start at 11.30am, proceeding along Mansfield rd, Upper Parliament St, Market Sq, Derby Rd and back through College St to get to the Albert Hall. The rally at Albert Hall will start around 12.30pm – 1pm (tickets from local trade unions). Speakers (locally and nationally via video links), music and contribution from 1pm to 3pm – and beyond! There will also be a Notts SOS stall at the rally. Sign the Notts SOS petition against council cuts that we will present in the New Year. This briefing has been specifically arranged for voluntary sector partners to attend. general@onenottingham.org.uk with your name, role, organisation and email address. Light refreshments will be available and feel free to bring your lunch to munch! I look forward to seeing on 17 November. On Saturday 12th November 2011, meeting outside Boots on Upper Parliament Street, protestors and activist of Notts Uncut proceeded to Vodafone in Clumber Street, to remind them of the £8 billion pounds that they owe in taxes. This day of action marked one year of activity by Notts Uncut who have protested relentlessly against the companies who have been highlighted as moving their operations off-shore to avoid paying UK tax, linking this to the cuts in services that are supposedly due to lack of money in the public purse. Other usual suspects were also visited including Topshop, Dorethy Perkins, another Vodafone, BHS in Broadmarch and of course Boots, eventually arriving back in the Market Square for tea and cakes at the Occupy Nottingham camp. Two Nottingham residents, a pensioner and a wheelchair user, have been charged with aggravated trespass. The pair, dubbed the “Atos Two” by supporters, were arrested following a peaceful protest of the examination cente of Atos “Healthcare” on Stoney Street on September 30th. Notts Save Our Services supports the 30th November Public Sector co-ordinated strike action and we support all public sector workers who take strike action. The Con-Dem Government proposals are for public sector workers to pay more, work longer and receive less. The Government wants to privatise public services. The Government and the private sector see public sector pensions as a barrier because employees transferred out of the public sector must be offered “broadly comparable” pension schemes under the Fair Deal on Pensions. That is why George Osborne wants to end the Fair Deal on pensions. The strike against attacks on pensions represents a strike to defend public services and is therefore in the interests of all of us (and our families) who use or will use public services. Public Sector pensions are neither “unfair” nor “gold plated” and have not been the cause of hardship in our communities or in the private sector. The unfairness lies between the rich and the poor, with the richest in society receiving pensions averaging £175,000 a year, 97% of executive directors in FTSE 350 companies having company-sponsored pension arrangements (compared to one third of private sector workers), and with most executives able to retire at 60. This is on top of growing income inequality with top incomes growing by 64.2 % over the past decade while average earners’ income has increased by 7.2 % so that at the present time the total income of the richest 10% of the population is higher than the combined income of the poorest 50% of the population. Public sector pensions are not “unsustainable” and in March 2011 George Osborne himself told parliament that cutting public service pensions is about “filling the hole in the public finances”, demonstrating that these attacks have nothing to do with demographics and people living longer but are further attempts to make working people pay for a problem that they did not create. The suggestion that strike action is falling into a Government “trap,” as Labour Party Ed Balls has stated, can only undermine the strike and does not serve the interests of the public. We call on everyone to respect the Unions’ decisions and to wholeheartedly back co-ordinated strike action on November 30th. Notts SOS values and respects our public services and those who work in the public sector. We acknowledge that they carry out some of the most important work in our society, including nursing, midwifery, care of those of us who are elders, vulnerable, have disabilities or are children; providing emotional as well as practical support and often working more than their paid hours. We defend their right to take strike action. It is now a year since the inspiring action of a number of students at Millbank during last year’s student fees protest in London. As a result of that and other anti-austerity protests a number of people have been sent to prison. It is important that we as a movement support our imprisoned comrades. Remember: they are inside for us and we should be outside for them. We list details of some of those imprisoned below. Please consider writing to some or all of them. Michael Newton is serving a 12 month sentence for June 30 action and multiple other minor charges. Hopefully out on early release on 30th December. Michael welcomes letters, posters and pictures.